Twitter wants your money, or at least a new way to monetize all those characters you’re using up with more than those annoying sponsored tweets promoting nothing you ever want. According to Mashable, the social media company announced today that we’ll now be forced to steel our online shopping addiction while ranting about the day's hottest topic. 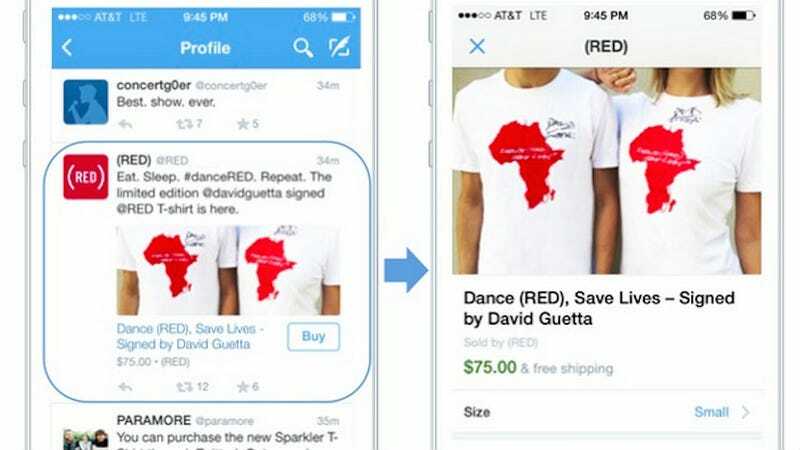 There will be a “Buy Now” button on tweets for brands like Burberry and bands like Megadeth, where users can click and go right to where they can buy that fall trench coat or new metal album. In addition to starting with a small number of "Buy Now" partners, they’re also pairing up with product selection platforms like The Fancy which means, if they do this with Pinterest … we might be in deep trouble and forced to question how strong our financial responsibility really is. Then again, it looks like Pinterest and Twitter might not join forces because Twitter thinks it’s better than the every woman website. "There is a real-time component to Twitter that isn't replicated anywhere else. I think that lends itself to items with a temporal component... or anything with urgency," Hubbard says. Translation: Twitter sees itself as a powerful platform for more spontaneous purchases and limited-time offers. Translation of that translation: Pinterest and Facebook, you can't sit with us.